It always amazes me how a just reminiscing about flavor can evoke such powerful feelings. My mother in law had her favorite candy, Werther's Caramel hard candies filled her candy jar (and pockets, but she wouldn't admit that.) When my husband and I were first dating, offering me those little gold-wrapped candies was about as comfortable as she could be. After we married, she would give our children Werther's candies each time we would visit. It became a sweet family joke that grandma had the market on these sweet buttery caramels. April 5th is National Caramel Day, and I can't think of a better way to celebrate than by making a recipe specific to this sweet family favorite. 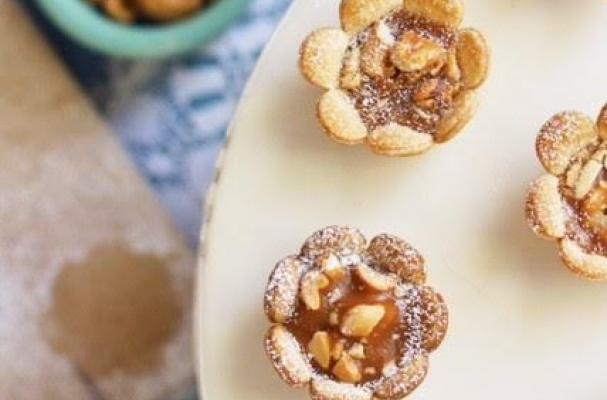 Chef Gale Gand and Werther's have been kind enough to share this delightful recipe using Werther's soft caramels as a main ingredient. Using a daisy shaped cookie cutter 3 inches in diameter, cut out flowers of pie dough and gently push them into a mini muffin tin. Bake at 400 degrees for 9 minutes, until golden brown. In the meantime, unwrap each caramel and push it into the chopped cashews, then roll it into a ball. As the blossoms come out of the oven, place a cashew caramel ball into each one. Return to the oven for 3 minutes to melt the caramel. Let cool to set, about 15 minutes.